Cormac Browne who captained Kilcock Celtic and helped himself to a goal in their 7-0 rout of Clane United. 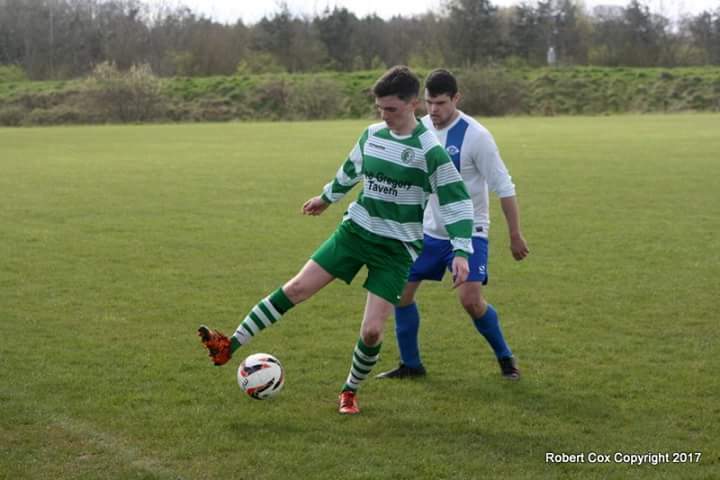 Kilcock Celtic 7-0 Clane Utd. Having drawn (2-2 away) against the same opposition earlier in the season, Al Myles’ men expected another tough outing but after putting in their finest performance of the season the hosts ran out comfortable winners. There were some well taken goals particularly from Adam O’Connell, who scored 2 on the day, his first 2 goals at senior level for the club. O’Connell’s first came after a splendid right footed strike from about 20 yards that lobbed over the goalkeeper. Remi Kareem was not to be outdone by his friend and team mate when he calmly dinked his shot over the Clane stopper and into the back of the net. Clane were spared somewhat when the referee blew the game up 20 minutes from time, which disappointed Kilcock who looed to bang in a few more goals aswel as running on a few subs. Goal scorers on the day were Shane Fitzgerald, (2) who also had 5 assists, Adam O’Connell (2), Remi Kareem (2) & from Captain Cormac Browne.